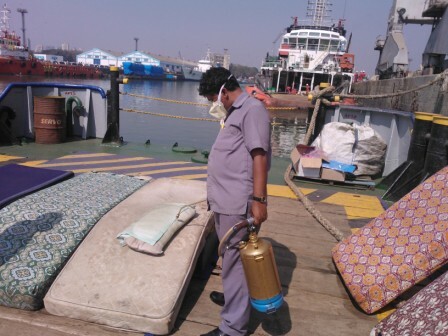 Rajashree Pest control provides pest control / Fumigation services to cargo ships, cruise liners, yachts and INS war ships. Our office is located at the prime location of Fort, Mumbai very close to Mumbai dockyard. Rajashree Pest Control provides one of the most comprehensive commercial pest control services. We incorporate some of the latest advances in pest inspection & control methods as well as providing ongoing staff training to ensure our customers receive the highest level of pest control / fumigation service available. Pest infestation is not uncommon onboard vessels and ships, it is essential to take charge of the situation to eliminate the pests especially rats, cockroaches and bed bugs. Ships provide ideal conditions that allow pests to multiply and thrive, with the danger of transmitting serious diseases to crew and passengers. Ships can also transport pests to countries where they have no natural predators. 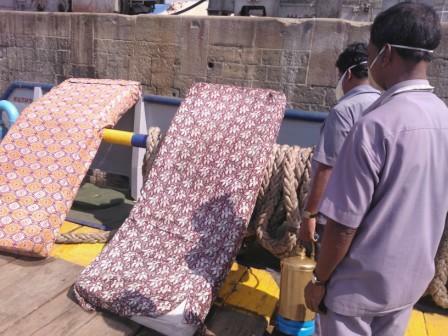 Ships are constantly exposed to numerous passengers and crew members with their luggage, which increases the likelihood of introducing pests to the ship. Rats are known to damage electric wiring, which can be very dangerous for ships. In addition, they contaminate foodstuffs. They can also transmit serious vector diseases to humans. Bedbugs hiding in mattresses and cracks. They have increased dramatically in the past ten years in ships. Bed bugs infestation can impact the health of a passenger and navy crew due to sleepless nights. Their treatment and eradication is essential for improving and maintaining good public health standards on board ships. Pests can enter through the ship’s open spaces such as doors, ramps and portholes as well as by accessing the ship through ropes tied to the pier. Ports also store large amounts of food, such as, which attracts pests and harbours them. 1. Time limitations as the ship stay for a very limited time on port. 2. Continuous moments of passengers, crew staff and foodstuff. 3. Many harborage places for pests like ducting, voids, walls and ceilings as well as behind equipment, between bulkheads and deck heads. 4. Standing water can lead to mosquito breeding. Rajashree pest control’s technicians are well trained to carry out pest control services on ships and vessels quickly and efficiently. We provide the survey and action plan quickly and precisely. Rajashree pest control provides a proper method of control for the targeted pest and the application of the most appropriate pesticide (including the area to be treated and the dosage) must have the least impact on people, livestock, foodstuffs or other sensitive cargo. Early identification of the presence of pests is very important to avoid large infestations particularly present in older ships. Rajashree pest control provides an Integrated pest management solution with continuous monitoring, where applicable, to help eradicate these problems.